In this installment of the Sparrow sewalong, we're going to be putting scissors to fabric. Last time, we went over the fabric requirements and chatted a bit about sizing. Let's keep going! First up, we're going to match the selvedge edges of our fabric edges and fold in half, with the right sides facing towards each other. The selvedges of the fabric are the edges that look like tightly woven bands running down the sides. The grainline runs parallel to the selvedge on woven fabrics. Lay out your pieces on your fabric according to the pattern layout for the size you have chosen and the width of your fabric. The pattern layout in the booklet is a one directional layout – the pattern pieces all face the same direction. The one directional layout is great for my fabric, because I'm working with this pink velveteen which has a nap. The nap is the direction of the pile; you can feel it when you stroke the surface, one way feels smooth and the other feels bristly. The colour of a napped fabric can also be quite different in each direction. Usually the colour is more lustrous when the pile is smoothed flat, but much deeper and richer when the pile is brushed and standing up. Pay particular attention to the pattern layout if you're working with a nap, as the direction of the nap needs to be the same on each piece. The same goes for a fabric with a strong pattern – you don't want some flowers pointing up and others right side down! 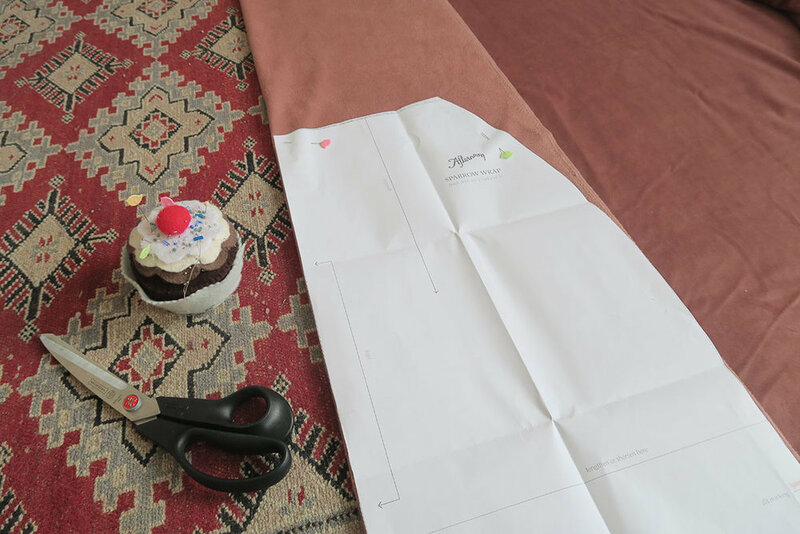 Once you're happy with how you've pinned your pieces, you can go ahead and cut your fabric! The Sparrow dress pattern includes seam allowances of 15 mm (5/8"), so you can cut right along the edge of the paper pattern. Bear in mind that the pattern layout images in the book don't include the layout of your pattern on your lining! So don't forget to cut out those pieces too. I got my fabric on sale and bought what was left on the roll. Which means I got a bargain (only R80 for 1.5 metres!) but I also inherited a pattern layout puzzle. Essentially, my fabric was not long enough to lay each skirt piece end to end, and not wide enough to lay them side by side. Here's how I solved it. First off, I laid out my fabric flat, and created a small fold parallel to the grainline – just big enough to fit the back skirt piece. Once that was cut out, I was able to fold the remaining piece in half and fit in all the other pieces! Please excuse my well-worn paper pattern in the picture, this one has already been used a number of times! I was lucky that I wasn't relying on my velveteen self fabric doubling as my lining, otherwise it would have never worked! So if you're also cutting a size A, and using different self and lining fabrics, you might also be able to get away with less fabric. I always err on the side of caution when giving fabric requirements – there is little more disheartening than not having enough fabric. That being said, just as I was patting myself on the back for a puzzle well-solved, I had a rather nasty run-in with my own carelessness. I merrily cut out all my pattern pieces only to discover that I had cut two of the same bodice piece, instead of reflecting it before cutting. You will notice above that the bodice piece had to be cut twice using my method of laying out. This fate will not befall you because you are likely more switched on than I, and hopefully following the instruction booklet and cutting both pieces out from a double layer of fabric. Do what I say, not what I do! Anyway, after a brief period of madness and despair wondering how I could rectify the situation (I felt it was irretrievably bad), I decided to soldier on and patch together the second bodice piece. I am hoping that given the wrap-over nature of the dress, most of the sinful patchwork will be hidden. It does mean that my bodice will have to wrap right over left (opposite to how the dress is designed) but more on that later. I was horrified at my mistake and very tempted to try to gloss over it, but in the interests of full disclosure, there you have it. We all make boo-boos from time to time. Lastly, using tailor's chalk or a dressmaker's pen, take note of the pattern markings on the paper and transfer them to your fabric pieces. This includes all dart markings, pleat lines and notches. I'm old fashioned and like to do this with chalk. It dusts off nice and easily when you don't need the markings any longer. Right! I hope your pattern cutting was much happier and less eventful than mine! Next time we will start stitching our Sparrow. New here? Have a look at the first Sparrow sewalong session.